"Game of Thrones" will return to HBO on April 14. We now have an official date for the return of the eighth and final season of "Game of Thrones." Last night during the premiere of "True Detective," the first trailer for GOT aired and announced it's returning on April 14. But that wasn't the only thing that was important. Even though the trailer showed what is likely not to be footage from the upcoming season, it certainly dabbled in predictions that have been leaving a lot of fans on the tips of their toes. 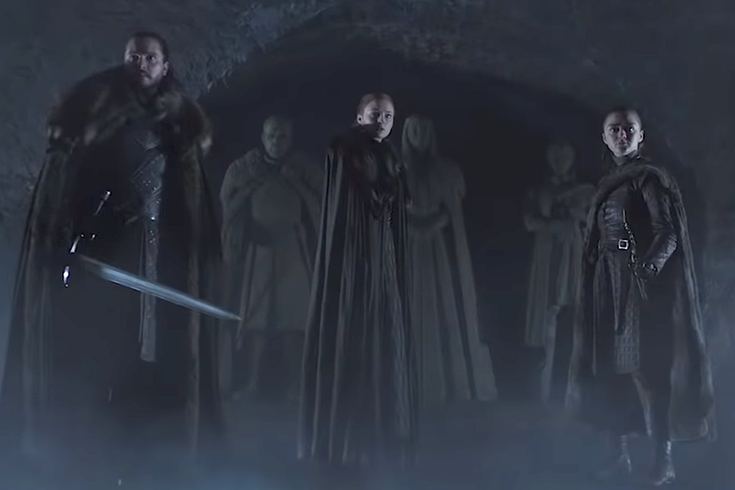 In the trailer we see Jon Snow, Ayra Stark, and Sansa Stark walking through the crypts in Winterfell. It begins as Snow, alone, walks through the crypt. As he passes the tomb of Lyanna Stark a feather falls to the ground. It’s then that he’s greeted by his two sisters, Ayra and Sansa. Sansa’s hair is notably styled similarly to Daenerys. As the three meet they reach the end of the crypt where statues of all of them reside, what is assumed to be their tombs. The torch then goes out as we see the feather that fell on the ground starting to freeze. What seems to be a cold, blue mist creeps into the crypt. Arya and Jon whip out their swords, fearful but ready for battle, as the fog draws closer and closer towards them. Does this mean Ayra and Sansa will die? Or that Jon will die? People have noticed Jon's statue is noticeably older-looking than his sisters', meaning it's possible he lives to an old age while his sister do not. Also, where's Bran? There's a fan theory that Bran is, in fact, the Night King and some think the fog is symbolic of Bran being the Night King. But others discount that theory, noting he's not officially a Stark anymore since he's claimed himself to be the Three Eyed Raven, which would explain his absence in the trailer. People have their own thoughts and theories. In conclusion, I'll leave with this tweet about the first season to remind us all of how twisted "Game of Thrones" actually is, so we can watch the trailer knowing our favorites are probably going to die this season. Hopefully it's at least poetic. RIP.